The Puppy Dog Pals show is all about the adventures of two pug doggy brothers, Bingo and Rolly. These two pug pups have a great owner called Bob, and a cat sister called Hissy and whilst Bob is out of the house, they go on adventures in their neighbourhood. 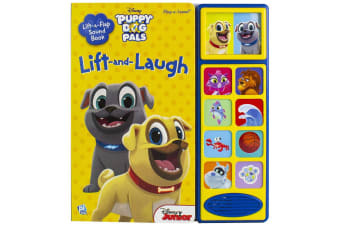 This super cute Puppy Dog Pals – Lift and Laugh Out Loud Sound Book is great for kids from 12 months old, with flaps to lift and sounds to accompany the story. 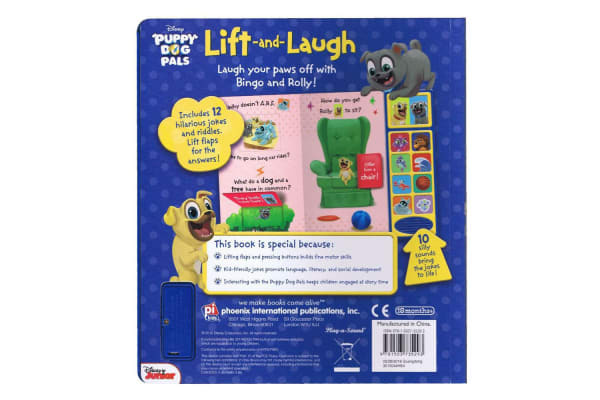 Puppy Dog Pals – Lift and Laugh Out Loud Sound Book is a fun book for Puppy Dog Pals fans, with hilarious jokes on each page as well as fun discoveries to make by lifting the flaps. 10 silly sounds buttons bring the jokes to life and make reading more fun. Kid friendly jokes with Rolly and Bingo. Puppy Dog Pals – Lift and Laugh Out Loud Sound Book is a perfect read out loud book for Puppy Dog Pals fans.